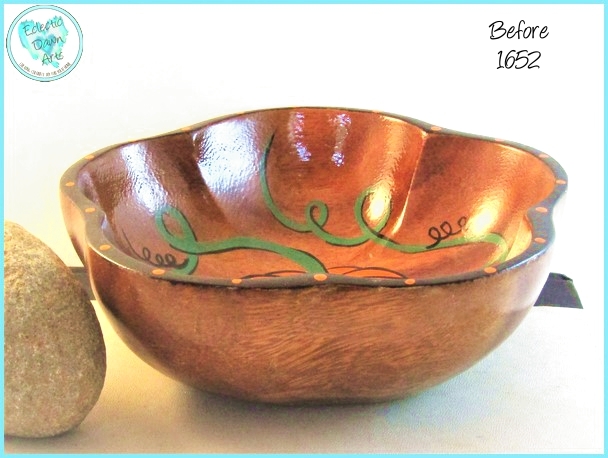 Bowl interiors feature Dawn’s art, while the exteriors show the beautiful wood grain. Each piece is signed, named, numbered, and UNIQUE (never duplicated). Due to screen variations, colors may not be true to hue. Many of the bowls are vintage, and some have imperfections due to age; original tags are left intact if possible. Wood is usually monkeypod, sometimes koa, teak, or a mystery. Read descriptions carefully. Not food safe, clean with a damp cloth, do not put in dishwasher. TB1536 'Monstera, Dig?' 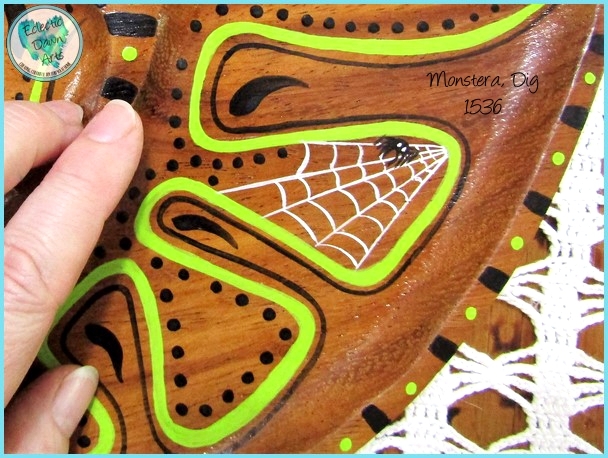 (accessories not included) SIZE: 7 x 14.5 inch - This shallow tray is shaped like a divided leaf and handpainted with a bright green Monstera leaf design with two small spider webs, complete with tiny spiders, on a vintage monkeypod wood tray. Fun, retro, whimsical! FREE SHIPPING. Not food safe, clean with a damp cloth, do not put in dishwasher. 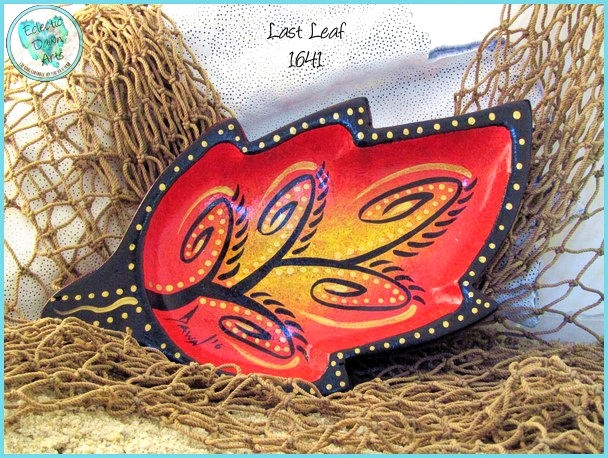 "Last Leaf" trinket tray, ring dish (accessories not included). TB1641, ~8.5" x 4.5" shallow leaf shape. There is something very special about the last leaf of autumn falling from a tree. 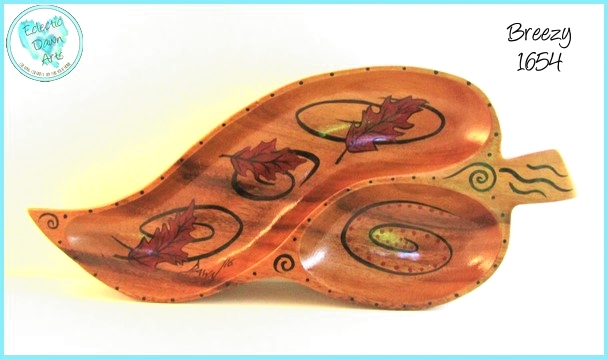 Bring the magic colors of falling leaves to your home with this beautiful hand painted tray. The leaf veining is done in a henna abstract style in black, rich red and yellow, accented with metallic gold dots. Free Shipping. Not food safe, clean with a damp cloth, do not put in dishwasher. 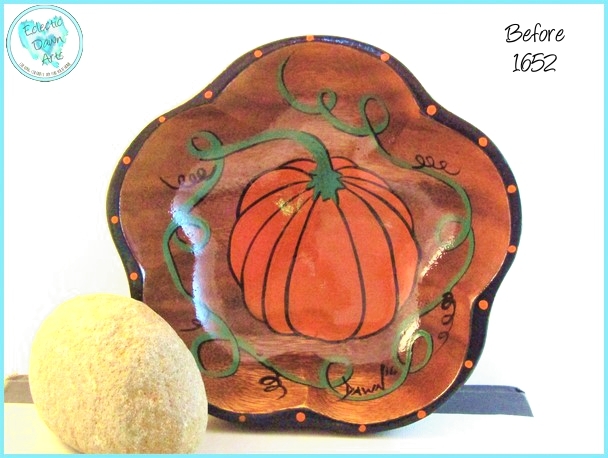 'Before' Painted Bowl (accessories not included), TB1652, ~6 inch - Five petal flower shape bowl (sizes are approximate) - 'Tis the season for pumpkin spice everything! Add this pretty little pumpkin to your fall decor, and he'll last all the way through Thanksgiving! 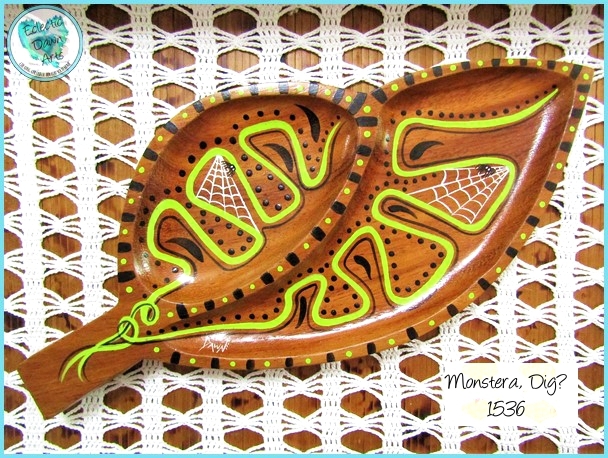 A great place to set your keys or to add a spot of autumn color on your table. Free shipping, not food safe, clean with damp cloth, do not put in dishwasher. 'Breezy' (accessories not included), TB1654, ~14 x 6.25 inch. Two-section leaf shape (sizes are approximate due to the organic shapes). The autumn breeze blows and color swirls around you...this time, it's burgundy oak leaves! A pretty place for keys or jewelry, or an accent of seasonal color on your table. Free shipping. Not food safe, clean with damp cloth, do not put in dishwasher.